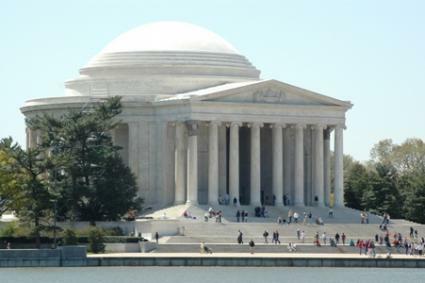 The Jefferson Memorial, completed in 1943, sits across the Potomac River Tidal Basin in Washington D.C. The white neo-classical building is dedicated to Thomas Jefferson, the United States' third President and author of the Declaration of Independence. Its white marble dome and classic columns can be glimpsed from points all over Washington. The National Mall and Memorial Parks administer the Thomas Jefferson Memorial. Open to the public 24 hours a day, park rangers are only on duty between 9:30 a.m. and 11:30 p.m. to answer questions. Visitors are not charged a fee nor do they need reservations to visit. The National Mall is host to a large number of events throughout the year with approximately 25 million visitors annually, so a planned event at the Memorial requires a permit from the National Mall and Memorial Parks service. Washington D.C. is a bustling metropolis with restricted driving routes and parking areas. The nation's capitol provides an efficient public transportation system, including trains and buses from outlying areas in Maryland and Virginia. Once you're in the city, you will have access to the metro buses and rails, as well as various tour buses that make stops at all major attractions, including the Thomas Jefferson Memorial. One such tour bus is the open-topped double-decker DC Tours. The tour offers stops and pick-ups at 30 separate locations from the Capitol to and the White House to the Jefferson Memorial and more. The tour is a great way to see all the major tourist spots, get photographs and board the next bus, as it makes its way through the area. Day passes are required for riding with DC Tours. One of the best times to visit is during the National Cherry Blossom Festival, which takes place last week of March and first week of April on most years. The weather is beautiful, temperate and ripe with the Cherry Blossoms. During this time the walk down to the Memorial is incomparable. The second best time is in late September and early October when the leaves are turning. Many historical programs are available to help children learn about Jefferson, the Memorial and Washington D.C. The park service offers the Junior Ranger Program with activities and badges that can be printed out before arriving in the metro area.